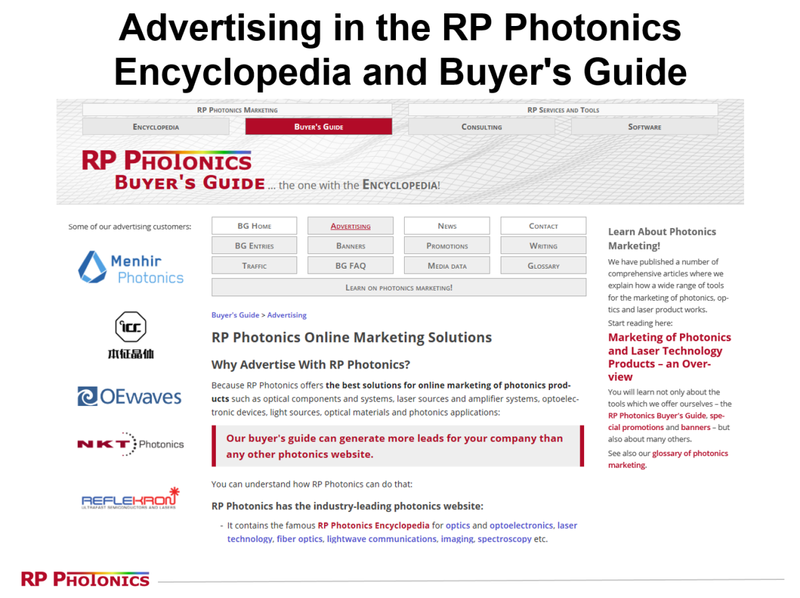 The RP Photonics Buyer's Guide contains 36 suppliers for nonlinear crystal materials. Ask RP Photonics for advice on the best choice of a nonlinear crystal material, or on the optimization of the phase-matching configuration and crystal length. Transparent crystalline crystal materials can exhibit different kinds of optical nonlinearities which are associated with a nonlinear polarization. For example, media with a χ(2) nonlinearity are mainly used for parametric nonlinear frequency conversion (e.g. in frequency doublers and optical parametric oscillators) and for electro-optic modulators, whereas χ(3) nonlinearities lead to the Kerr effect, the Raman effect, and four-wave mixing. In essentially all cases, artificial (rather than naturally occurring) crystals are used. The chromatic dispersion and birefringence properties determine the possibilities for phase matching and the phase-matching bandwidth, angular acceptance (for critical phase matching), etc. The magnitude of the effective nonlinear coefficient deff, which depends on the nonlinear tensor components and on the phase-matching configuration, is important particularly if the achievable optical intensities are low. Normally, the crystal material should have a high optical transparency for all wavelengths involved. Figure 1: A block of LBO and some crystals cut from such material. The photograph has been kindly provided by EKSMA OPTICS. The choice of the most suitable crystal material for a given application is often far from trivial; it should involve the consideration of many aspects. For example, a high nonlinearity for frequency conversion of ultrashort pulses does not help if the interaction length is strongly limited by a large group velocity mismatch and the low damage threshold limits the applicable optical intensities. Also, it can be highly desirable to use a crystal material which can be critically phase-matched at room temperature, because noncritical phase matching often involves the operation of the crystal in a temperature-stabilized crystal oven. Lithium niobate (LiNbO3) and lithium tantalate (LiTaO3) are materials with a relatively strong nonlinearity. They are often used for nonlinear frequency conversion and also for electro-optic modulators. Both materials are available in congruent and in stoichiometric form, with important differences concerning periodic poling and photorefractive effects (see below). Lithium niobate and tantalate are the most often used materials in the context of periodic poling; the resulting materials are called PPLN (periodically poled lithium niobate) and PPLT, respectively, or PPSLN and PPSLT for the stoichiometric versions. Both have a relatively low damage threshold, but do not need to be operated at high intensities due to their high nonlinearity. They have a tendency for photorefractive effects, which are detrimental for frequency conversion, but are used for, e.g., holographic data storage in Fe-doped LiNbO3 crystals. The tendency for “photorefractive damage” depends strongly on the material composition; e.g. it can be reduced via MgO doping and by using a stoichiometric composition. Potassium niobate (KNbO3) has a high nonlinearity. It is used for, e.g., frequency doubling to blue wavelengths and in piezoelectric applications. Potassium titanyl phosphate (KTP, KTiOPO4) may be flux-grown (cheaper) or hydrothermal (better for high powers, lower tendency for gray tracking → photodarkening). The “KTP family” of materials also includes KTA (KTiOAsO4), RTP (RbTiOPO4) and RTA (RbTiAsPO4). These materials tend to have relatively high nonlinearities and are suitable for periodic poling. Figure 2: KD*P crystals, including one with very large size. The photograph has been kindly provided by EKSMA OPTICS. Potassium dihydrogen phosphate (KDP, KH2PO4) and potassium dideuterium phosphate (KD*P or DKDP, KD2PO4, exhibiting extended infrared transmission), are available in large sizes at low price. They exhibit good homogeneity over large volumes and have a high damage threshold, but are hygroscopic and have a low nonlinearity. There are a number of borates, the most important ones being lithium triborate (LiB3O5 = LBO), cesium lithium borate (CLBO, CsLiB6O10), β-barium borate (β-BaB2O4 = BBO, strongly hygroscopic, often used in Pockels cells), bismuth triborate (BiB3O6 = BIBO), and cesium borate (CSB3O5 = CBO). Yttrium calcium oxyborate (YCOB) and YAl3(BO3)4 (YAB) are also available in rare-earth-doped form for use as a laser gain medium, and can then simultaneously be used for generating and frequency-converting laser light. Less frequently used are strontium beryllium borate (Sr2Be2B2O7 = SBBO) and K2Al2B2O7 (KAB). LBO, BBO, CLBO, CBO and other borate crystals are suitable for the generation of relatively short wavelengths, e.g. in green and blue laser sources, and for UV generation (→ ultraviolet lasers), because their bandgap energy is relatively high, the crystals are relatively resistant to UV light, and there are suitable phase-matching options. Borates such as LBO and BBO also work well in broadly tunable optical parametric oscillators and optical parametric chirped-pulse amplification. For mid-infrared (and partly also terahertz) generation, one requires crystal materials with a transparency range extending far into the infrared spectral region. The most important of these media are zinc germanium diphosphide (ZGP, ZnGeP2), silver gallium sulfide and selenide (AgGaS2 and AgGaSe2), gallium selenide (GaSe), and cadmium selenide (CdSe). Gallium arsenide (GaAs) has also become useful for mid-infrared applications, since it is possible to obtain quasi-phase matching in orientation-patterned GaAs [13, 21]. Excessive optical intensities during operation may instantly damage a crystal. Unfortunately, nonlinear crystals often need to be operated not far from their optical damage threshold in order to achieve a sufficiently high conversion efficiency. This implies a trade-off between conversion efficiency and crystal lifetime. Note that even if the nominal intensity is below the nominal damage threshold, there may be problems due to fluctuations of the beam power or local intensity (e.g., if a beam profile has “hot spots”), or due to isolated defects in a crystal, which are more sensitive than the regular crystal material. Even well below the threshold for instant damage, some crystal materials exhibit a continuous degradation within the used volume, e.g. in the form of “gray tracking”. Such phenomena are particularly common for operation with ultraviolet light. Note that a gradual degradation can also lead into instant catastrophic damage via excessive heat generation. Hygroscopic crystal materials deteriorate when they are not always kept in sufficiently dry air (or a dry purge gas). This applies e.g. to KDP and BBO, and in a lesser extent to LBO. It can be helpful to keep such a crystal at a somewhat elevated temperature, which makes it easier to keep it dry. Operation of nonlinear crystals at temperatures below room temperature (in order to achieve phase matching) is generally problematic, as it may lead to condensation of water on the crystal surfaces if the surrounding air is not very dry. Even if the crystal material or coating is not sensitive to water, small water droplets may focus laser radiation more tightly than under normal operation, and thus damage the crystal material. 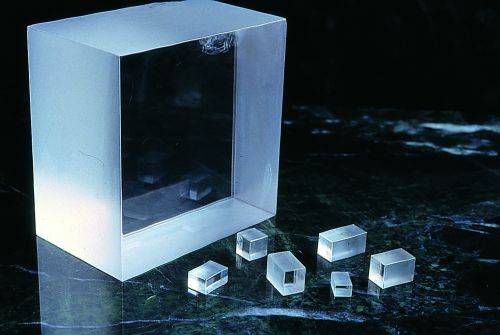 Crystals which are non-critically phase-matched in a crystal oven may exhibit problems when the crystal temperature is changed too rapidly or too often. In particular, anti-reflection coatings may be damaged due to different thermal expansion coefficients of the involved materials. Crystal lifetime can also be strongly dependent on the material quality, although certain degradation phenomena appear to be intrinsic limitations of the material. For high-power UV generation, nonlinear crystals may become consumables: they need to be replaced quite often within the lifetime of the whole laser system (e.g., every few hundred hours of operation). Often, several problematic aspects come together in the regime UV generation: crystal materials are generally more sensitive to ultraviolet light (having high photon energies), exhibit a higher absorption in that regime, and in case of ultrashort pulses the high group velocity mismatch enforces the use of a shorter crystal, which requires high optical intensities for a given conversion efficiency. 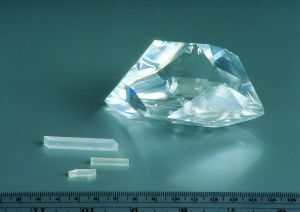 For some applications, nonlinear crystals with a very small thickness of well below 1 mm are used. This may be necessary for minimizing the group velocity mismatch, e.g. in optical autocorrelators for extremely short pulses. A common method for obtaining ultrathin crystals is to first optically contact a thicker nonlinear crystal with some substrate (e.g. of fused silica) and then to polish the crystal down to the required thickness of e.g. 20 μm. The group velocity mismatch in the thicker substrate material may not matter, as the nonlinear interaction takes place only in the thin crystal. The substrate only serves to mechanically stabilize the thin nonlinear crystal. It is also possible to fabricate free-standing crystals with a thickness of only 100 μm, sometimes even below 30 μm. Periodically poled lithium niobate: high efficiency nonlinear conversion crystals available off-the-shelf for SHG, OPO, DFG and SFG interactions. Crystals suitable for generation from visible to mid-infrared wavelengths. Laserton's nonlinear crystals are with good optical homogeneity. We could provide LBO, RTP, KTA, KTP, KDP, BBO, LiNbO3, SBN crystals. 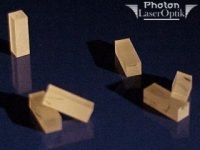 We offer periodically poled MgO:LN and MgO:LT crystals/waveguides for highly efficient optical wavelength conversion (SHG, SFG, DFG, OPO, OPG) from UV to mid IR and THz. 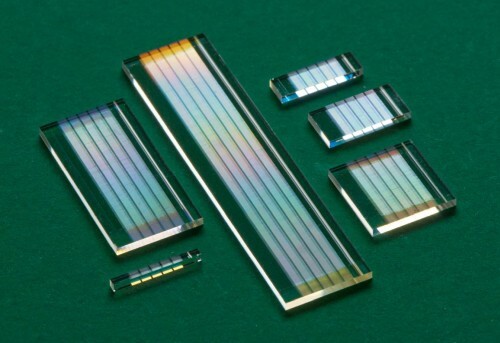 EKSMA Optics offers a complete portfolio of nonlinear optical crystals: BBO, LBO, KTP, KDP, DKDP, LiIO3, LiNbO3, MgO:LiNbO3, AGS, AGSe, ZGP, GaSe, CdSe from stock or manufactured according to customers specifications or for specific application.